I'm thrilled to share with today's interview and giveaway. Artist and author Cheryl Harness graciously offered some of her Little House art. TWO winners will receive a set of six different Little House note cards and a signed Laura Ingalls Wilder Coloring Book. Before you enter the giveaway, I want to share some of her work, including a sculpture and painting, along with an interview. 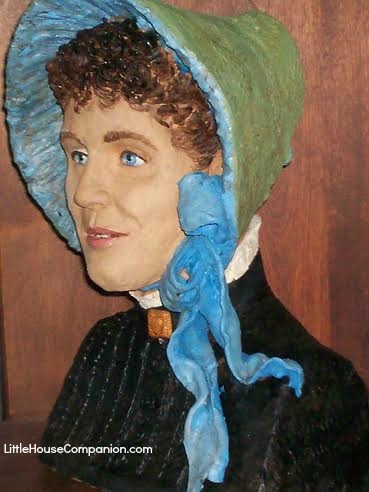 Take a look at this sculpture Cheryl made of Laura on her wedding day. Here's another view of Laura Ingalls Wilder on her wedding day. Click to see more detail of Cheryl's painting of Mary and Laura. Well-used talent! Thank you for sharing those with the readers and me, Cheryl. Cheryl took the time to answer some of my questions in this interview. Q. 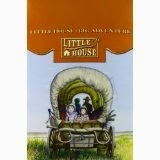 When did you first read the Little House books? Do you have a favorite book? Which of the illustrations is your favorite? A. My third grade teacher, Pauline Nicholls, read the books to our class at Blue Hills Elementary, Independence, MO. My favorite shifts from one to another. Just now it’s Farmer Boy. I love me a book with many mentions of FOOD! Illustration? That’s easy. Mary in her brown-and-blue dress for college. Page 95. L.T.o.t.P. Q. 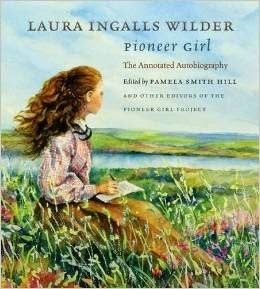 What inspired you to create a Laura Ingalls Wilder coloring book? A. 1. Wanting to make some money. 2. Wanting an excuse to draw in pen & ink. Q. Did you research or just use your imagination as you created the coloring book? A. A little of this + a little of that. After years of writing & illustrating historical picture books, I’ve a shelf full of period costume reference books. And of course there are the Ingalls/Wilder photos in William Anderson’s wonderful books. You’ve probably noted that he wrote a fine foreword to my informative coloring book. Q. You write and illustrate about much more than just the Little House books. Tell us about the books you like to write and illustrate. A. Over the last 28 years or so I’ve written and/or illustrated some fifty books. It’s in large part due to my childhood with the Ingalls family that I gravitated toward history books. And my realistic style dovetails nicely with projects like my picture book biographies published by the National Geographic: The Revolutionary John Adams, for example. One of my earliest, Three Young Pilgrims (3YPs) is perfect for the autumn of the year, being as it shows and tells the tale of one of the families, that of Isaac & Mary Allerton, who came over on the Mayflower with their three small children. My idea then and for many of the books that came after was to tell about a genuine historical event or individual and include much of the CONTEXT. For instance, my book about The Amazing Impossible Erie Canal showed, in my illustrations, how a lock works + lots of MAPS. 3YPs includes maps of the Pilgrims’ journey, a cutaway illustration of the Mayflower, an illustrated timeline and an afterward showing earlier voyages and what happened after that first Thanksgiving. My books have been well used in homeschooling families. It’s still one of my all-time favorites and still available in paperback. My newest, Flags Over America, is a picture book history of flags, particularly that of the Star Spangled Banner. It came out this past September 2014. Q. Please tell us about your writing and illustrating process. How long does it take you to finish a book from concept to giving it to the publisher? A. My picture books have taken me, on average, about seven months. The process? a. Once an idea occurs to me, I look it up in my encyclopedia and/or online; read more about it. b. I write & research (often involving travel) as I go, being mindful of the pages and the illustrations that I’ll wish to include. After all, I tell & show the story. EXAMPLE: p. 1: title page. pp. 2/3 front matter. pp. 3 & 4: the beginning text, and so on. c. REVISE (there’s a lot of that – as I tell kids in my school visits: ALL REAL WRITERS WORK ON THEIR WRITING SOME MORE!). I work as quickly/obsessively as I can because the illustration is the most time consuming, a good two months at the very least. d. Scribbly DRAWING in pencil on tracing paper, planning the dance between text & pictures. e. Transfer drawing to illustration board (heavy Strathmore cold press) f. perfect/complete the drawing (lots of research here too, in my own big library full of books w/ images of sailing ships, wagons, horses & such) g. PAINT. Takes me about a week to do one painting for a double-page spread. One book took me six years. That was Just For You to Know, my 2006 historical novel, a coming-of-age tale set in 1963-64 Independence, MO & the darling of my heart. After HarperCollins let it go out of print, I published a softcover edition available from my website, and it’s available on Kindle. 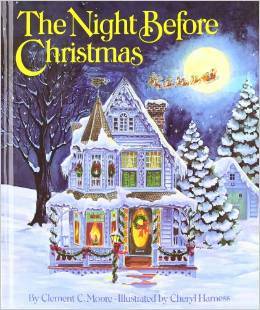 Many of my books, such as The Night Before Christmas, my all-time BESTSELLER, I only illustrated so that took me about four months, as I recall. Most of my art is done at the size you see it in the finished books, with watercolor & colored pencil. Sometimes a bit of ink or pastel. Q. You include a free coloring page of Betsy and Tacy looking down on Deep Valley on your website. Maud Hart Lovelace is one of my favorite authors, so I must ask if you have more illustrations from her works. A. That coloring page is from my BETSY-TACY Coloring Book, which is available at Etsy. AND my painting of Betsy, Tacy, & Tib, a.k.a. The Immortal Trio, has been made into a print, sold by the Betsy-Tacy Society up in Mankato, MN! Q. What is your current project? A. Being a slave to my enthusiasms, I have several! Been working on a murder mystery. That and a few half-baked middle grade novels infest my computer. I’ve a couple of picture books, a painting, and a sculpture in the works and I’m waiting to hear if an editor likes a sample chapter I sent her. Right now, I need to go and edit one of my Nonfiction Minutes. This is a new thing as of this school year. Nonfiction authors write & read aloud a brief teaching moment on ALL sorts of subjects. These Minutes are for elementary school students and teachers and they’re FREE. Here are a couple of examples: here and here. Q. Do you have any advice for aspiring writers or illustrators? A. To paraphrase Stephen King, Read a lot. Write a lot. Make art. LOOK at what’s being done, see how the words go & how few of them there are. Learn the bookbiz. Check out the Society of Children’s Book Writers & Illustrators. And before you worry about publication, give yourself time to develop your craft. Q. Would you like to tell the readers anything else? A. I can be found and, with luck, ‘Liked!’ on Facebook. And do, if you haven’t, go to Mansfield, MO and ponder on Pa’s fiddle. Consider the sustaining joy it brought. I loved getting to know you and your process a bit more, Cheryl. 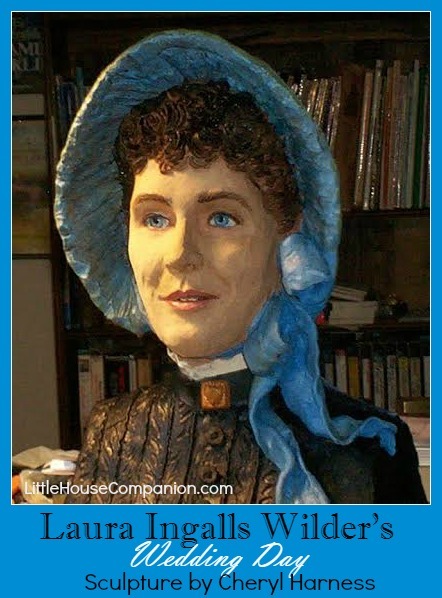 Thank you for taking the time to share your craft with Little House Companion readers. As one who would like to get serious about writing, I appreciate your advice. I had forgotten all about Strathmore drawing and watercolor paper from my college days. Readers, if you haven't looked at her The Night Before Christmas book, do so. It's beautiful. And don't forget to like Cheryl on Facebook. William Anderson wrote the forward for the Laura Ingalls Wilder Coloring Book. If you have read much about Laura's life, you know that Mr. Anderson is THE respected authority on her. 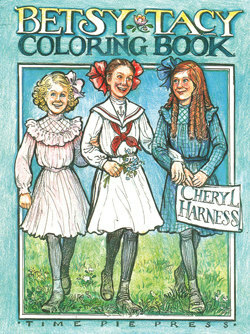 I don't have my own copy of the coloring book, but from what I see that Cheryl offers for free, the coloring book will be an excellent choice for all fans of Laura Ingalls Wilder and the Little House books. Be sure to check out Cheryl Harness's FREE coloring pages and her Etsy shop. She encourages all to print and color them. Big Sister (age 8) looked at the coloring page I printed for her, and without any context, she knew it was Laura and Almanzo out for a ride. 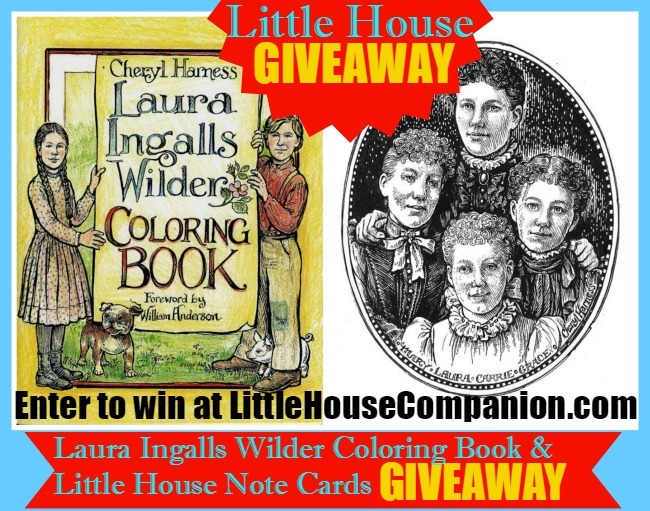 TWO lucky winners will each receive a Laura Ingalls Wilder Coloring Book and a set of six LIW note cards. To enter the giveaway, please use the Rafflecopter widget/link below. (Please go to the blog to enter.) Thank you, Cheryl Harness for taking the time to share your passion with us and for providing a fabulous giveaway! Two winners will be chosen. After I email them, they will have 48 hours to reply or a new winner will be chosen. Giveaway runs through Monday, November 17, 2014.